Selecting "Connector API" menu / New data source will open a wizard where a new connection can be created. This option is available if the Connector for Connector API is selected under "Consume data" on the left-hand side. In each configuration dialog, you can reach the corresponding Intrexx Help by pressing F1 or by clicking on the "Help" button. Every connection created by you is listed in the right-hand area. 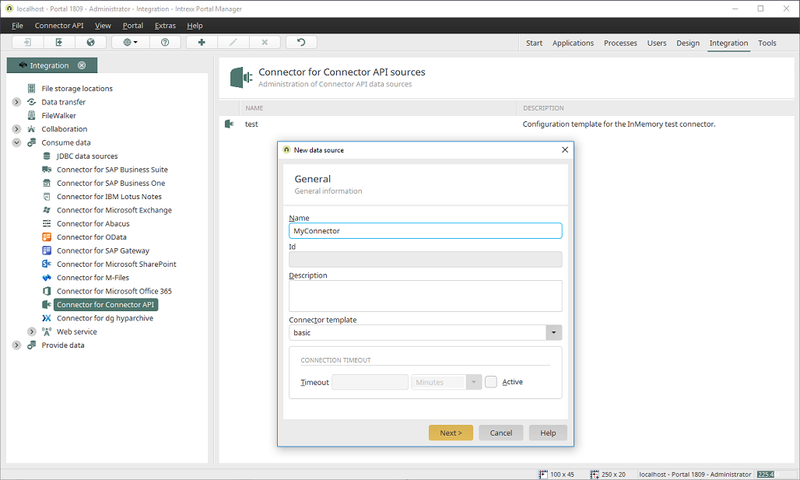 All of the functions available for editing a connection can be reached via "Connector API" menu, when an existing connection has been selected on the right. Displays the name of the connector. Displays the description of the connector.